Election Panel Calls For More Early Voting : It's All Politics A bipartisan election administration commission, appointed by President Obama, delivered a list of recommendations aimed at dealing with the problem of long lines at polling places. 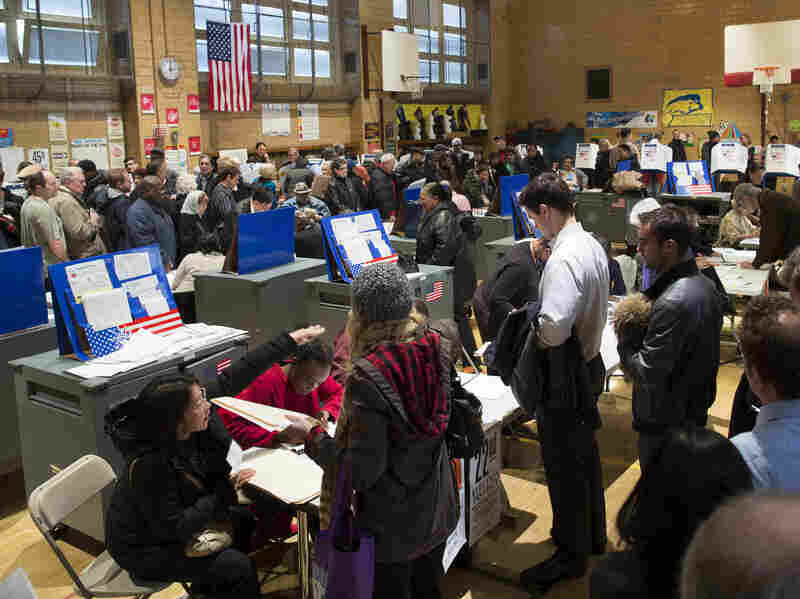 Voters wait for their chance to cast a ballot in the Chelsea neighborhood of Manhattan, Nov. 6, 2012, in New York. A bipartisan presidential commission has endorsed more early voting, expanded online voter registration by the states and the increased use of schools as polling places. The 10-member panel, appointed by President Obama after his 2013 State of the Union pledge to identify ways to shorten lines at polling places, released its recommendations Wednesday after six months of work. "Our aim was to transcend partisan divisions and view election administration as public administration that must heed the expressed interests and expectations of voters," said Robert F. Bauer and Benjamin L. Ginsberg, commission co-chairs, in a joint statement. The Commission on Election Administration also warned of an "impending crisis in voting technology" as older machines wear out. The standards and certification process for the next generation of machines, the panel concluded, needs to be reformed to allow for more innovation and less expensive technology. Other recommendations included the increased use of electronic poll books, enhanced training for poll workers and the collection of election data on a more uniform basis.